For anyone who read mainstream comics in the 1980s, Fred Hembeck was a constant and, if you thought about it for a second, extremely odd presence. 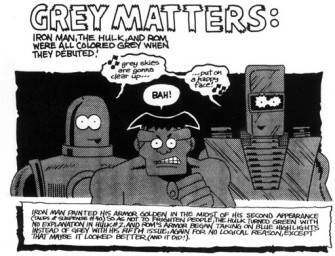 Best known for a series of humor strips lampooning popular characters at Marvel Comics (although he's done a ton of work involving DC heroes as well), often in an interview format, during a point in their history where superhero comic books were extremely uptight and gravely serious, Hembeck's worked for about a dozen comics companies and publishers in all. This includes a brief series back in the '80s for Fantaco Enterprises (not Fantagraphics) when he moved into their neck of the woods near Albany, New York. TOM SPURGEON: How did this project come together? FRED HEMBECK: The project came together because of Al Gordon. SPURGEON: Gordon is a well-known mainstream comics inker. HEMBECK: Marvel and DC. Many years ago one of my strips complimented his work on the Spider-Woman book. That caught his eye. We became friends in the intervening years, even though I've only actually seen him face to face once because he's out in San Francisco and I'm on the East Coast. He would call from time to time. One time he suggested that maybe it would be nice to put together a collection of all my Dateline strips from the Buyer's Guide. I thought it was kind of an iffy idea. I didn't know who would really go for that. I kind of played along. "Yeah, yeah. Okay, Al that's interesting. Maybe we'll do that." He kind of kept at it and then he got Erik Larsen involved, who at that point had become the publisher of Image. I wasn't sure if he was goofing on me. I got a hold of Erik and said, "Is this really true? Are you interested in putting this together?" He said, "Yeah, sure. But I'd like to expand it, and not just put in all those Dateline strips but any unpublished stuff, things from other fan magazines. Anything that wasn't published by Marvel or DC or other copyright holders. You can throw it all together in one giant volume." So we did, and that's how it came to be. SPURGEON: So was Erik Larsen a fan? Why was he interested in a big book of yours? HEMBECK: Apparently he was a fan of mine. There were some quotes he gave to introduce a Newsarama interview I did where he said some pretty lofty things about me. Maybe he was just trying to sell the book, but who knew? I only met Erik once, in 1990 at a comics convention. I did go out to lunch with him. He seemed like a nice enough fella. I didn't know he was going to be willing to risk his shirt on a book by me. What can I say? I don't really know. I'm just happy to have his support. SPURGEON: The archival nature of the project, has it been hard for you to place your hands on all of the work? Are the originals or good copies still in your possession? Did you have to search anything out? HEMBECK: No, it's pretty much all here. A lot of it was shot from the original Fantaco books, because they were crisply published in black and white on nice, white paper. I didn't have to worry about the originals. I have most of the originals from the oldest material, anyway. I started selling some of my strips from the '90s and even the late '80s, but I've always held onto the earlier stuff. Pretty much everything is here. All downstairs. SPURGEON: Now the book includes a lot of work from the Buyer's Guide as well, right? SPURGEON: I know that my own copies of that magazine haven't kept very well. Were there any problems with the use of the old magazines, or did you use originals? HEMBECK: A majority -- not a majority, but a lot of those were in the Fantaco books. So I worked from those copies. The rest I had actual originals of, and I just went down to Staples and shrunk them down to a nice size in black and white to fit my scanner and we shot from those. SPURGEON: Are you doing the production work yourself? HEMBECK: Except for putting together the text -- I don't know what the text is going to look like. Yeah, but there's really no production work outside of assigning the pages and what order they go in. Towards the end of the book there's section where there's maybe three, four different pieces of art on one page. I'd say upper left or lower right... but not really a lot of production. Just a lot of art, you know? SPURGEON: Is this the first time in a while that you've looked at a lot of this material? I know that when some artists put together a project of this scope, there are emotions involved in dealing with this many pages of your life's work. Was it interesting to look at this material? HEMBECK: It was... pretty interesting. The Fantaco books, seven of them, they kind of lie around the house and from time to time I would look at them. Not read them, but look at them. So that material wasn't too big of a surprise. Digging out some of the stuff that never made it into those publications, I'd totally forgotten some of the material. I should point out that I didn't re-read any of the stuff. I figured, "You know, when I get the whole, big book in front of me I'm going to sit down and read it then, see what it's like." The only exception to that rule was that for a time I was in the CAPA-alpha... what do you call it -- the APA. You're familiar with those, right? SPURGEON: Sure. Comics Amateur Press Associations. CAPA-alpha was the biggie. HEMBECK: In 1980 for a couple of years I did a lot of really cheesy 'zines and stuff. I wanted to use some of the best of that material. That I felt I should re-read, to see how relevant it would appear to people outside of that rather isolate sphere. That stuff was kind of interesting to look at. There's about 60-70 pages of that material in there. 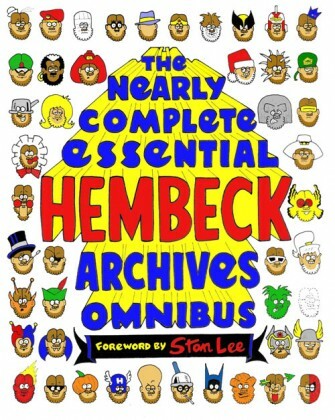 HEMBECK: Well, about half of it is full-page illustrations. But there's some wacky strips in there, where I just sat down with a Pentel and a piece of typing paper and did little cartoon "Fred at Home" strips. Kind of funny. In fact, the book's one and only use of the dread "f" world is buried somewhere deep in that section. You know, I do say it from time to time, though usually not in my strips. But anyway, I didn't want to weight the whole book down with too much of the APA material. So that was kind of revealing. It's kind of nice. As I mentioned at one point, I could see in the mid-'80s where I was losing interest in the stuff and making poor artistic choices. "Oh, I don't need to use rapidographs anymore, I can do it with a Pentel. Sure. That will look good." [Spurgeon laughs] Guess what? It doesn't look good. But at Al and Erik's decree, every single Dateline strip must be in there. So we have some in there that I wish they weren't. There are two in there with a rip down the middle because that's how they came back to me from the Buyer's Guide and the US postal office. I couldn't find the actual issues of the Buyer's Guide where they first appeared to shoot from, unfortunately. You kind of miss a few words here and there. But again, there's quantity here so if the quality wavers back and forth you gotta forgive that. I hope people will forgive that. SPURGEON: You mentioned there were strips that you lost interest in, or that there was a period of time where you lost interest. Why has your interest faded at certain times? Was it only the one period? HEMBECK: It was just a matter of feeling like I was kind of getting redundant that point. Plus I was doing more work for Marvel and DC, and I was hoping to branch out a bit more with the big companies at that point. Again, I got a package back with the strips ripped, and that made me think why I was beating my head against a wall and the stuff comes back ripped. It wasn't the fault of the Buyer's Guide, but still, it pushed me to the edge of saying, "I think I'll forget this for now." I got a revived interest in the '90s. I was doing some other stuff, and a friend of mine put together Comic Book Profiles, a small magazine that came out for about ten issues. Matt Poslusny. He was a local friend, and he asked me to bring the strip back. And I said, "Okay, I'll give it a shot." I did, and I found I enjoyed it. Not long after, Jon Cooke asked me to add it to his magazine, Comic Book Artist, and then I thought I might as well make a clean sweep of it and bring it back to the Buyer's Guide, too. Just like that, I was back into it. Ever since then, I've been enjoying it. SPURGEON: Weren't you also preparing a book for Tundra that kind of drew you away from your strip work? HEMBECK: Right. Around 1990, '91 or so I was preparing to put together a strip for them called KIDZ, the call letters of a TV station -- run by kids! Hey, that's clever, huh? [Spurgeon laughs] I never really finished it. They never even knew about it. By the time I got around to the layouts for page 300 they went out of business. I'm not always the best at planning things. I'm trying to be a little more on top of stuff these days. I put a lot of work into that. My daughter was very young, and I'd split time taking care of her. My wife was off at the compute place, IBM -- you've heard of them. So I was doing a lot of house husband stuff, and I thought that'd be a great thing to do. But it never went anywhere, unfortunately. SPURGEON: Three hundred pages might have doubled the lifetime page output of Tundra. HEMBECK: I could have really helped them upgrade their percentage. But of course they didn't even know about it. I had met both of the [Teenage Mutant Ninja] Turtle guys [co-creators Kevin Eastman and Peter Laird] a couple of years earlier at a convention, and they were very nice and very friendly to me. I actually did a short Turtles story that they stuck in a reprint of one of their books, the one with the Richard Corben cover. I didn't put it in the Omnibus, because it was copyrighted to the Turtle guys, you know? SPURGEON: There's a famous story as to how you got started, in that you were rejected as a traditional pencil artist by Marvel, and then you went the letter-writing route and that developed into work for Marvel. That sounds like the kind of thing that just couldn't happen now. Did it seem surprising to you at the time that you were getting work? HEMBECK: Oh, yeah. It was kind of crazy, actually. Back when I was in college in the '70s, you would see a lot of people's names in the letters columns and then a year or two later they'd end up working for Marvel and DC. I started writing letters to them, not realizing that most of those people who were writing letters and getting work at Marvel or DC were writers, not artists. Again, I'm a little messy on the details there. [Spurgeon laughs] I didn't write as many letters as some of these people, but I probably had 30 or so letters published in the early '70s. I took my portfolio around, and it was actually Vince Colletta... Honest to God, the guy looked at my portfolio, went through the whole thing, and said to me, "You know, kid, I'd tell you you could make it in comics, but I'd just be jerkin' you off." And he did the hand gesture at the same time. [Spurgeon laughs] That's the god's honest truth. You don't forget stuff like that. Then he smiled, shook my hand. I got my portfolio together, left the building, got on a train, went back home. I got into my car. I'm kind of in a daze at this point. I got in my car to drive out of the parking lot at the train station. Almost pulled out in front of another car that was coming at me. It just missed me. This kind of shocked me. I remember thinking at this point, "I'm like the 5th Challenger. I'm living on borrowed time." [Spurgeon laughs] So I'm going to do it, I'm going to keep working at this stuff. So I went home, and I started drawing little cartoon strips to my friend, because I'd just left four years of living in Buffalo with roommates. I used a little cartoon character of myself, so that's how that developed. They knew what I looked like, and other people didn't. Years later, people would say, "I didn't know you had hair. I thought you had a big cleft in your head or something." No, no, that's hair parted in the middle. They didn't know. I sent a few letters like that to comic books. I had previously written letters, but they were just handwritten letters. And one of them caught Bill Mantlo's attention. He liked it. He asked if I could re-draw it because it was in colored marker, and they put the re-drawn version in Iron Man #114 and paid me $35. I thought to myself, "Gee, if Marvel likes it, maybe I should send something up to the Buyer's Guide." That's when I did a strip of cartoon Fred interviewing Spider-Man. Alan Light liked it enough to publish it and asked for some more. And it snowballed from there. But to answer your question: no, that doesn't happen anymore, and yes, I can't believe it did. SPURGEON: This book doesn't include the stuff published by the big companies. SPURGEON: Is there a whole other book out there to be had? Is there a ton of material left? HEMBECK: If Marvel put the stuff together, that would be a pretty decent volume. I've done a lot of stuff here and there for Marvel over the years. In Marvel Age alone I probably did at least 100 issues with a two-pager in the middle. Most of the time it was the centerfold, so it would be hard to do a book with 100 centerfolds. 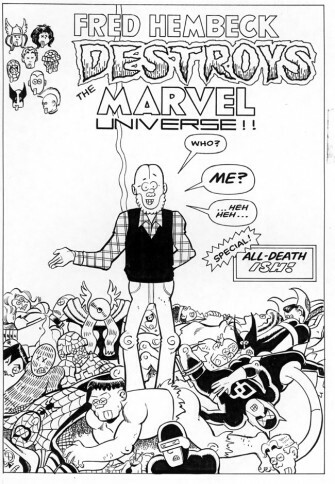 There was a collection called Fred Hembeck Sells the Marvel Universe that came out in 1990 in which they had 32 pages and put together a bunch of those. Jim Salicrup let me select a bunch of those; he put them together at Marvel's behest. 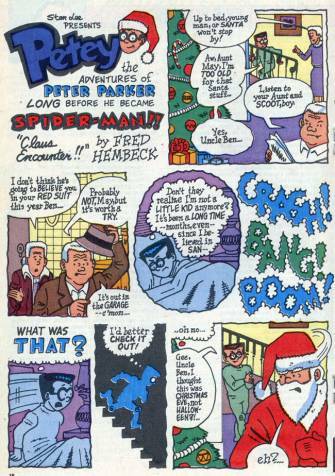 Some Spider-Ham stories, and some stories of "Petey" -- Peter Parker as a Dennis the Menace type character. And of course a couple of solo books. If Marvel wanted to put my stuff together, that would be great. DC, of course, everybody always says, "I love those strips you did in the Daily Planet." Gag strips, they were called "Hembeck." I don't see how you could put that together unless you did a flip book. That would be kind of cool. Hey, I wouldn't mind. Haven't done that much for DC overall. A couple of things for 'Mazing Man years and years ago... I struggled to figure out the last thing I ever did for them, and I realized the other day it was one of those Green Lantern Origins and Special Cases or something that they used to put out a few years ago when my friend Ron Marz was writing it. The character at the time was a cartoonist. Not Hal Jordan, but Kyle whatever his name was. [Kyle Rayner] He had me do the comic strip art that the character was doing in the comic book. You know how that goes. That kind of crazy stuff. SPURGEON: I know that you have an appreciation for the older comics. Can you talk about some of your more fundamental influences? Certainly your work was very different than other stuff that was being done at the time. Do you have classic influences? HEMBECK: At one point, I sat around -- and this was several years before I had anything published -- just re-drawing Beetle Bailey strips. So I kind of had Mort Walker in the back of my head. I also sat around re-drawing Neal Adams strips. You can't see that. [Spurgeon laughs] I have like a whole sketchbook from when I was 18 where I copied whole issues of Green Lantern/Green Arrow and Batman. I'm going, "Man, I'm the new Neal Adams." But I guess they didn't need one. Mort Walker had a lot to do with it. Years later I tried to work Al Wiseman into my style when I did the "Petey" stories. I love that stuff he did on Dennis the Menace. I guess there's a lot of John Stanley/Irving Tripp in my stuff, too. Very simple, clean line. I like the clean line look. I tried working with a brush a couple of times in my career. It didn't work too well. It worked better than the flair pen, I'll tell you that. I prefer the rapidograph. I remember one day I was at a convention, and Gil Kane was on the stage. This was just before I started doing this stuff. Someone asked him, "How do you get that look you have in Star Hawks?" He said he used rapidographs. I thought that was kind of cool, so I went out and bought some rapidographs. So I guess Gil Kane had something to do with it, too, even though I wasn't that big a fan of Gil Kane. Steve Ditko, Jack Kirby, Curt Swan, Carmine Infantino -- those are the ones that kind of hit me as a kid and stayed with me. SPURGEON: What was it that you appreciated about Infantino? HEMBECK: I loved the way the pages are designed. I love the way his characters move across the page, the little funny things he does with the hands. I loved the Strange Sports Stories with the little shadow characters in the captions... things along those lines. I saw some stuff from the '40s and early '50s where he was riffing on [Milton] Caniff. That's nice and all, but I really like the later '50s material. I read an interview with him where he said that he went to some design class around that time and it gave him a whole new perspective. Always very much appreciated his artwork. Still really love it. Love Adam Strange, even though the stories are kind of dull. SPURGEON: Did you tell me that you may have pulled some of your presentational style, your approach to narration, from Roberta Gregory -- perhaps even subconsciously? HEMBECK: Yeah, that's true. I hadn't even realized that until recently when I've been doing these interview and trying to think back about what got me started here. Yeah, the comic she did in the '70s, I think it was called Winging It. It had a nice story in the front of the magazine, and a couple of pages in the back where she talked directly to the audience. She did that in her later books, too. Sixteen, twenty panels on the page staring at you, talking right at you. I really liked that. It caught my attention. I like her writing as well. I kind of picked up on that. SPURGEON: Looking at this array of comics, were you able to note stylistic developments in your work? I think you told me that you didn't use the swirly knees at first, although that came along fairly quickly. HEMBECK: Right. I noticed in putting this book together that in the very first strip I did there were no swirly knees, but in the second one there is. I guess I had a revelation one night. [Spurgeon laughs] It was "swirly knees." SPURGEON: Did the overall style develop from there, or did you settle in pretty quickly? HEMBECK: In the very earliest stuff, people are almost like stick figures, with very pronounced knees and elbows. The legs in some cases almost come down Popeye-like, triangular with the big feet. I kind of got rid of that after a while. Eventually I gave characters more traditional musculature, yet still with the knobby knees and the elbows and stuff. Nowadays I just kind of mess around. Sometimes I use that style, and sometimes I use a more exaggerated style where people almost have arms and legs like sticks. It depends on how I feel like drawing it at that time. The Fred character, his head always looks the same. But over the years he's been a little short guy, he's been a fat guy, he's been a real tall thin guy. One time I put a really big nose on him for no apparent reason. [Spurgeon laughs] Someone said, "What are you doing there?" I said, "I wanted to know what he'd look like with a really big nose." I just kind of mess around. One thing I do have trouble with is keeping character on model. If you see some of my strips... I've been doing some strips over there at The Fred Hembeck Show at Quickstop Entertainment. I just do repeated images of little Fred, and he's ranting. I do him on three pages and then cut him down panel by panel. He starts out really short, and by the time I finish he's grown a head. He's taller. I always have trouble with that for whatever reason. SPURGEON: Does the seriousness with which comics are taken now make it easier or harder for you to riff on them? HEMBECK: It's hard to say. Most of the stuff I do now... in recent times I haven't done as much because I don't work for the Buyer's Guide anymore and Jon Cooke's magazine went into hibernation or something. I haven't had too much of an outlet for pure comics commentary. But a lot of what I do is based on older material. I'm not really keeping up with what's happening now. I just can't do it. It has a nostalgic ring to it, and people expect what I give to them, when I talk about stuff from the '60s or even the '70s. I'm not sure what would happen if I sat down and tried to do a strip about Bone or something. SPURGEON: Is it just that you have a connection to those older books, or do you think they're better in some qualitative way? HEMBECK: I think it is because I have a connection to them. They were there when I was a kid, and it meant a lot to me growing up, comics did, obviously. From '61 to about the mid '80s I was entranced by the stuff. I kept reading them after that, but you kind of start reading them almost out of habit, and you become a grumpy old man. "Ah, the Flash would never do that." Then you go, wait a second, don't get upset, it's only a comic book charcter. 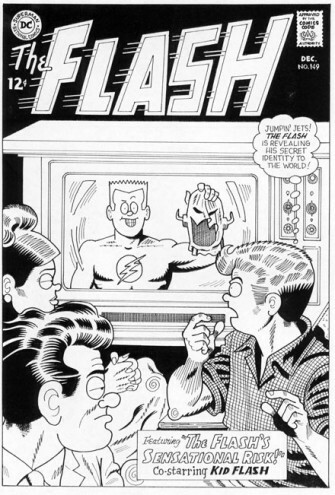 Then you realize if you want to know what the Flash would do you can go back and read your Infantino comics. I've read enough superhero comics that if I'm looking for some superhero comics entertainment I'll go read something in one of the old Masterworks. If I read something new, I'd rather tread something by someone like Alex Robinson or Jeff Smith. An independent type thing. I don't get as much of a chance to read those as I like, because I'm having too much fun drawing and writing. I don't read as much as I used to. SPURGEON: Sometimes I feel like I've read my lifetime's allotment of Green Lantern. Not that I hate Green Lantern or anything, but I think I've maybe read enough of them. HEMBECK: I know exactly what you mean. A lot of people were upset about Spider-Man breaking up with his wife, and I'm thinking, "I only read a couple of stories after they get married." So I don't feel so bad about that situation. SPURGEON: You're reprinting the Fantaco books. That's a whole different time in comics publishing that I don't think people remember now. If I remember right he was a comic store owner he moved into publishing briefly. Can you talk about that period a bit? HEMBECK: Sure. Eclipse was one of the very first companies to come out and put out their own books. They put out the Sabre book by [Don] McGregor and [Paul] Gulacy. They needed a second book. They didn't have anything, because McGregor and Gulacy were taking a while in getting one together. Maybe it was Detectives, Inc. that was going to come next, by McGregor and Marshall Rogers. Again, they didn't have it. Richard Bruning, who I knew, said to his friend Dean Mullaney, "Why don't you have Fred throw a book together? He's got all these pages from the Buyer's Guide. You could put it out fast." That's how the Hembeck Best of Dateline book became the second publication from Eclipse. And it sold well enough. But for whatever reason, the second one, Hembeck 1980 -- which I did in '79 and thought it was so futuristic sounding. [Spurgeon laughs] Mainly because when I was a kid there was a movie called Frankenstein 1970, and it's like 1961. They had at least nine years before that one became dated. Again, I wasn't looking forward. I did this Hembeck 1980 and they weren't getting around to publishing it. Meanwhile I had moved up to Troy, New York, from where I had previously lived, which was Kingston, New York. It wasn't that far of a move, but it was close to a store in Albany called Fantaco. I had a friend who worked there and each week I would go in and buy my comics. They were considering putting a book together, publishing a book by a fellow who worked there, Raul Vezina. He was a very a talented cartoonist who passed away far too early, the early 1980s. He was working the counter so he didn't have much time to get his comic strip, Smilin' Ed, together. They needed to get a book out. So I asked Dean Mullaney if it would be all right if they published Hembeck 1980 instead. "Oh sure, it'll be fine." They sent me to Fantaco and Hembeck 1980 was I guess the first Fantaco publication. Then they subseqeuently reprinted my first book with different color scheme on the cover, and eight extra pages. Whoo hoo, a collector's item for sure. I did a total of seven books for them. At that time there was Wendy Pini, putting out her [Elfquest] books with Richard. There was Dave Sim, who was putting out Cerebus. Then there was my book. And First Kingdom and a couple of undergrounds. Eclipse was putting out some books. SPURGEON: Can I ask what the print runs were like back in those days? HEMBECK: I remember Abbott and Costello Meets the Bride of Hembeck, I remember they published 10,000 of those. SPURGEON: That's kind of a lot. HEMBECK: It's kind of amazing when I think about it now. That was like a $1.25, 32-pager, 8 1/2 by 11 black and white, color cover. Pretty cheap. We sold a lot of those. My publisher Tom Skulan, he was friends with Phil Seuling, of course. Seagate was distributing a lot of books then. That helped. SPURGEON: You mentioned commissions earlier. Is that a significant portion of the art you do now? HEMBECK: It seems to be lately. Ever since this book was announced, there's been quite a spike in requests. SPURGEON: Is it people rediscovering you? HEMBECK: It seems to be. It's kind of neat. I'm enjoying it. SPURGEON: Is there something you can identify as the bulk of your commission work? HEMBECK: It's mainly covers. I do get some character sketches and stuff. I discovered a while back that if I do a character sketch or a cover and put it on eBay, I can sell it that way. SPURGEON: What would drive you to recreate a cover? Is it about figuring out how that art works? Is it particularly enjoyable for you? Is it a horrible chore that you're doing for commerce? 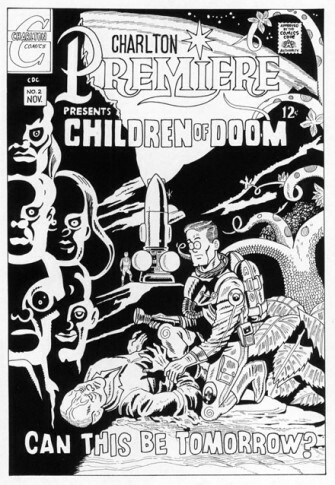 Right now I have a Charlton Premier Children of Doom cover that I did about eight years ago. I managed to turn it into a strip in the Buyer's Guide, because I would shrink it down, rubber cement it to a larger page, and write around it. I've never been able to sell that sucker, even though I think that's a really cool comic. SPURGEON: What are your hopes for the Omnibus? Are you interested just as far as getting the book out there? Are you trying to reach a certain audience? Is it just an expectation on your part that you have fans who want to see this book? HEMBECK: It would be nice to have it all out there for the people who have wanted it. I've received a lot of response on the Internet when it was announced. I was surprised; it was nice. Beyond that, it would be kind of neat for someone who hadn't seen that stuff before to pick it up and maybe wind up liking it. And there'd be a whole revival of interest. In me. There you go. My aspirations in a nutshell. SPURGEON: You have an all-original project you're working on, am I right? HEMBECK: An all-original Little Freddy type story. Little Freddy is in this book, too. Somebody around 2000 contacted me and had plans to revive The Comic Reader. He wanted me to do a strip for it. I thought, "I do Dateline, I don't want to do the same thing for him." I loved doing those Petey stories for Marvel with Peter Parker as a Dennis the Menace type character -- he's not a menace, but he's drawn in the same kind of style. So I thought why don't I do stories from the childhood, kind of a Dateline-type thing but not with me talking at the reader. 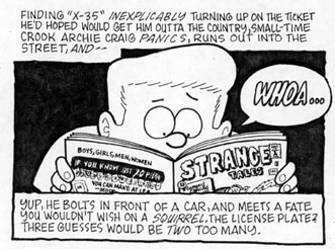 Put it in a story like an old-fashioned Dennis the Menace comic. That's how that came about. Of course that magazine never went anywhere. It was never published. I ended up with 10 pages of unpublished stuff. It's in the omnibus -- I put it in first as a kind of origin story for people not familiar with my work. Now I've been talking to a fellow who wants me to concentrate on a full-length graphic novel. I'm going to concentrate on 1963-1964. It would cover comics, some cool things that happened to me in the 5th grade that I remember to this day. The Beatles had just come out. Universal monsters were big in my life at that point. I'd just discovered MAD Magazine. Marvel, Monsters, MAD and the Merseybeat -- quite a year. So it kind of hits a lot of little areas of pop culture. Hopefully that's something I'll be able to follow this up with. Although it will take me a while to get it all done. SPURGEON: Last question: Why Brother Voodoo? 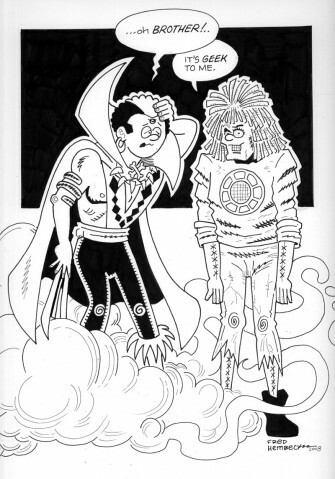 HEMBECK: Brother Voodoo goes back to a convention I went to before I was a cartoonist. It might have been in Toronto when I was living in Buffalo. Marv Wolfman and Len Wein were up at the dais answering questions. The Superman/Spider-Man book had just been announced. A fan stood up to ask a question. He was one of those clueless type guys. No offense, but there's a few of them out there. He said, "Well, I hear that Marvel and DC are getting together to team Spider-Man and Superman. Why those two?" [Spurgeon laughs] Everybody starts laughing, because it's such an obvious thing. And Marv or Len, I don't know which one, says, "It was either that or the Brother Power/Brother Voodoo team-up." From that point on, the two characters were forever connected in my mind. Already at that point Brother Power was legendary for how lame a character he was. Brother Voodoo really wasn't that lame a character but he had a goofy name and he had a short publishing history so he wasn't successful and he got tarred with the same feathers for being a goofball. Early on, I never got a chance to do much with Brother Power, but when I was doing the Marvel Age stuff and I couldn't figure out what to do I'd trot out Brother Voodoo and have him say or do something goofy. I used him a whole bunch of times.